Monisha Rajesh wrote lovingly about the Indian railways in her previous book but this set her wondering whether the train journey had lost its allure elsewhere — for which there is a strong case to be made in Britain, at least. The constant outpouring of anger in the media about the horrors of modern travel seems to have captured the public mood: the delays, the cancellations, the overcrowding, the fatuous announcements, the garish logos of the privatised companies and the overspending on major projects all seem set to undermine our love of the railways. Rajesh, however, muses that the bigger threat might in fact come from the opposite, that is that the railways have improved so much (with the scrapping of draughty carriages, the smoothness of the ride brought about by the loss of the familiar tagadada tagadada thanks to continuous welded rails, and the advent of high-speed trains in many countries across the world) that it is the relaxed nature of train travel that has all but disappeared. Rajesh sets out to test this theory by journeying across the world by rail, covering 45,000 miles in 80 trains over an eight-month period. She drags along her boyfriend Jem, now her husband, as an afterthought, having decided, belatedly but wisely, that some of the more exotic countries she visits may not be safe territory for a lone woman, particularly a brown-skinned one. She starts with a few routine runs around Europe. Quickly bored, she heads off to Asia via the Trans Mongolian Railway to Beijing, then heads to Japan and soon finds herself on the Death Railway, the line built by prisoners of war in Burma at the cost of thousands of lives. She is soon grateful to have Jem tagging along. In Moscow she makes the mistake of taking a local train to a small town called Kubinka where, amid worldwide publicity, Putin had supposedly just opened Patriot Park, a Disneyland-type experience based on military capability. The train journey itself, in a rusting, leaky carriage with shifty-looking fellow passengers is bad enough, but the taxi ride to the non-existent park and an even hairier drive back make her conscious of the risks of going down branch lines. It takes Rajesh several weeks to rediscover the joys of train travel but before too long she begins to appreciate that the unique qualities of the rail journey are not confined to India. There are numerous fabulous journeys where only the setting of the sun stops her spending all day at the window. She learns that it is the people who travel on the railway and the inevitable way conversations are struck up that make train journeys so different and so special. She is constantly amazed by the generosity of strangers who share their food, book and pay for hotels, offer advice and give up their seats, and her descriptions of this random set of fellow-travellers from across the globe end up as the core takeaway from this delightful book. Train travelogues can be tedious, especially when written by gricers (train buffs who we learn are known as foamers in the USA owing to their tendency to get really excited when spotting a particularly rare locomotive) because of their insistence on technical and timetable detail. Rajesh, though, is not only blessed with an elegant style, but is witty and ever ready for a bit of self-deprecation, being only too aware that she is a tourist temporarily invading other people’s lives and that hasty conclusions may well be simplistic. 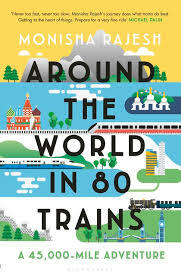 If there is a threat to the continued existence of romantic and exotic train travel, it is not so much the advent of the fundamentally banal high-speed lines or the cuts to unremunerative services, with many countries still undergoing a Beeching-type process, but globalisation which risks undermining the uniqueness of place. Jem loses his trainers on the way to Tibet and worries whether he can find a pair of New Balance replacements in Lhasa, only to find that one of the monks they meet in the main monastery is wearing a pair. Almost everywhere they visit has a KFC, a Starbucks or an Apple store (mostly ersatz) and Rajesh quite reasonably tries to defend this, mindful of the fact that if she has access to these goods, why shouldn’t the rest of the world. Their ubiquity, however, means that so many local products, which she gamely tries (not the three squeaks, live baby mice that you pick up producing the first squeak, dip in spicy sauce – squeak – and pop in your mouth – squeak) are squeezed out. Fortunately, the unique aspects and the efficiency of the railways compared with other forms of transport mean that, at least so far, their popularity is enduring.